You’ve built your skills and can play quite a few ukulele tunes. Congratulations are in order, as you’re no longer a beginner! Now that you’ve begun to build your repertoire and you know that the ukulele is a great match for your personality as well as your lifestyle, it’s time to treat yourself to a better-quality instrument. If you’ve spent much time at all shopping for an intermediate to advanced ukulele, then you know that there are extreme differences in terms of price. While great beginner ukuleles can be had for under $100, intermediate instruments tend to cost up to $300 or perhaps a bit more. While an advanced player might be pleased with the way an intermediate uke sounds, he or she is likely to long for something fancier – curly koa, flamed maple, and other top tonewoods, plus showier inlays, bindings, and tuning machines. Because they are made with premium materials and components, the best ukulele brands for advanced players often come in at prices that begin around $300 and end well over the $1000 mark, particularly if you opt for a custom ukulele. As an advanced player, this may be acceptable since you’re investing in an instrument that you’ll be enjoying for years to come, and as you may find yourself earning a nice side income with your music. With these and other factors in mind, we’ve curated a list of five of the best ukulele brands for intermediate and advanced players with a solid suggestion for each brand. Each of the brands we’ve selected offers a variety of ukuleles in popular sizes ranging from soprano to tenor, and a few also offer baritone, bass, and /or contrabass (aka u-bass or rumbler) versions, adding to the list of potential choices. Like many popular brands, Kala ukuleles are available for players of every level. Many models are ideal for intermediate players, but only a few are built of solid wood. The Kala KA-ATP-CTG ukulele offers incredible tone thanks to a solid cedar top and solid acacia wood body, beautifully protected by a gloss finish. A rosewood bridge and fingerboard provide contrast, and a Padauk rosette and binding impart a simple, classic appearance. Grover tuning machines keep you playing happily. The cedar provides a loud, warm, deep tone. Curved for a great feel; very comfortable to hold and play. I would buy it again, and highly recommend it to others. Kala has designed a fine instrument with this model at a reasonable price. This is now my favorite ukulele; it sound beautiful and has perfect intonation without any buzzing. Who will Appreciate this Brand? 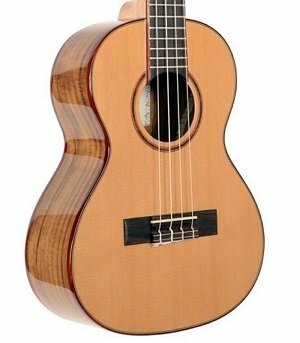 While this Kala tenor ukulele is priced for intermediate appeal, its solid wood and good-quality components appeal to advanced players, too. Reviewers are almost always pleased; do note that this instrument is made in China, and some buyers find that the setup isn’t quite right out of the box. Professional setup and minor alterations by a qualified luthier will remedy almost any minor flaw. Lanikai’s Makau Series ukuleles are designed and crafted in Hawaii, on the island of Oahu. While this brand does offer beginner-friendly ukuleles, it also offers a wide range of instruments meant to appeal to intermediate and advanced players. The Lanikai Kaena Concert Ukulele is beautifully crafted, with a body of solid, top-grade koa wood collected from Mauna Loa and Mauna Kea on the island of Hawaii. The Indian rosewood fingerboard is fitted with 19 frets, and Gotoh tuners keep the Aquila strings perfectly positioned. A hand-rubbed finish, Sitka spruce binding, and an abalone Makau inlay offer a stunning, traditional look. This handcrafted ukulele comes complete with a deluxe hardshell case and a makau pendant. This is an heirloom-quality ukulele meant to last for generations. It truly outshines imports. Built of premium components by Hawaiian luthiers, the Lanikai Kaena ukulele is certain to satisfy the most discriminating player. Built to pass the test of time, this is a magnificent instrument that will keep you happily playing for a lifetime. Note that Lanikai offers an entire range of instruments with solid designs for players of every level. Luna ukuleles are available for ukulele aficionados of every level, and offer particular appeal to intermediate players. Good components, interesting embellishments, and lovely finishes are to thank for this top ukulele brand’s widespread appeal. The Luna High Tide Series Koa Concert Ukulele is built of solid Koa with a satin finish. Abalone high tide inlay fret markers lend a touch of island-inspired style, and an onboard preamp allows for acoustic or electric enjoyment. A cutaway body style allows for easy access to the lowest frets, and an abalone ring surrounds the soundhole, creating a lovely finishing touch. A gig bag is included. All of my musician friends are thoroughly impressed and much joy has been shared passing this ukulele around the room. I do not know of a better A/E ukulele even for $350, as I own one of those and this one sounds better. Dollar for dollar, Luna makes great products! 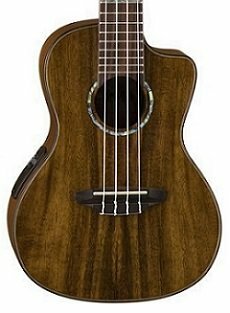 The Luna High Tide Series Koa Concert ukulele is marketed to intermediate players, but this instrument is also popular with advanced players who need an acoustic/electric ukulele to play. It’s a good choice for recording, as well. Players from beginner to advanced have reviewed this model, and almost all of them provide overwhelmingly positive feedback. Many are astonished at the quality to price ratio. Martin has been building ukuleles since 1916. This brand typically costs more than other imports, however there are plenty of models that will appeal to intermediate players. A few models come in at over $500, and offer excellent features that set them apart from their lower-end cousins. Quality craftsmanship and components help Martin ukuleles stand head and shoulders above many other popular brands. Featuring a solid koa top, sides, and back, the Martin T1K Koa Tenor ukulele offers a solid hardwood neck with a solid morado wood fingerboard with 20 frets. A satin lacquer finish and Aquila nylgut strings complete the package. A deluxe padded Martin gig bag is included. This is a very bright instrument, and loud, with lots of wonderful plunky ukulele greatness. The notes sound defined and well-balanced with no “wolf notes” that resonate louder than others. While the Martin T1K Koa Tenor ukulele is priced higher than many intermediate players prefer, it is at the low end of the price range for solid koa ukuleles. Advanced players who must adhere to strict budgets are likely to enjoy this wonderful ukulele, particularly after professional setup. Like Martin, Oscar Schmidt is a well-known guitar maker with a long history. The company dates all the way back to 1871, and offers a fantastic line of ukuleles to suit different tastes and levels. With so many well-made instruments from which to choose, nearly any player is likely to find one to suit his or her needs and taste. Quality woods, premium hardware, and affordable prices make this brand a very popular one worldwide. All Oscar Schmidt ukuleles are professionally inspected and adjusted in the United States. The Oscar Schmidt OU5 Concert Ukulele is part of the company’s acclaimed Koa Series, and receives top marks from beginning and intermediate players. 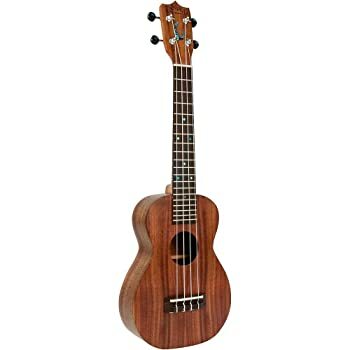 Even a few more advanced players enjoy using it for travel, camping, and other situations where an expensive ukulele might be at risk of damage. Its top, back, and sides are crafted of select Hawaiian Koa wood, and its Nyatoh neck is fitted with a rosewood fretboard. With 16 frets and a nice set of closed-back chrome Grover tuning machines, it also includes iridescent abalone binding and a beautiful abalone rosette. A natural gloss finish provides a simple, traditional appearance. A lifetime warranty is included. I’ve played Martins, Kalas, and Schmidts. The Oscar Schmidte is by far the best instrument for the money, Aquila strings and Grover tuners re a big deal. The Aquilas take a while to settle in but after the first week of playing and retuning, they’ll stabilize and become tonally rich. Well worth the price I paid, and I’d buy it again if I ever needed to replace this one, which I never expect to. The Oscar Schmidt OU5 isn’t perfect – but it does represent a good instrument for its price range. 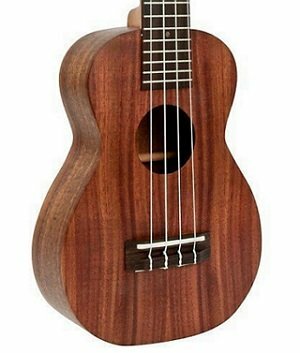 It’s a good choice for intermediate players who are struggling with a sub-par ukulele, and who want to take a step up without spending a lot of money. This probably isn’t the last ukulele you’ll ever buy, but it will definitely hold you over while you save up for your dream ukulele! Ready to take your ukulele skills to the next level? You’ll find that a good-quality instrument is an absolute joy to play, and that you’ll be more motivated to practice when you’re completely in love with your uke. We hope the following tips will make your choice easier and better informed. Materials and Components: Do not skimp when considering materials and other components such as sealed gear tuners designed to keep you playing longer between adjustments. While laminates are perfectly fine for beginners, solid wood tops offer far more richness. You’ll be amazed at the superior sound quality: Though you may be playing the same songs, they’ll sound far better on an upgraded ukulele. Size: Pick a size that feels comfortable to you. Listen to the unique sound that each different size ukulele makes, either live or on YouTube. If the sound appeals to you and the ukulele size is a good fit for your hands, then you’re going to enjoy playing it. Cost: As with all other things, cost is a definite consideration when choosing a ukulele that complements your growing skills. If at all possible, spend freely and consider the fact that this instrument will be a joyful addition to your life for years to come. Find your dream instrument and save up for it. Watch to see if it goes on sale (a decent likelihood if you opt to shop on Amazon). With just a little time and patience, you’ll soon be playing the ukulele you’ve longing for. ukulelemusicinfo.com is a participant in the Amazon Services LLC Associates Program, an affiliate advertising program designed to provide a means for sites to earn advertising fees by advertising and linking to Amazon.com.